You've seen the Avengers: Endgame trailer. You've scoured every frame of Avengers: Infinity War for clues. But today we've learnt perhaps the most important detail of all about Marvel's sequel to end all sequels; the Avengers: Endgame runtime. As revealed by AMC's listing for Avengers: Endgame on its website, and then confirmed by online retailer Fandango, the much anticipated sequel to Infinity War comes in at 3 hours, and 2 minutes long. That's 182 minutes of superhero good stuff burning into your eyeballs, pre-show trailers not included. While some are questioning how important those extra two minutes past the three hour mark must be to make the cut (they presumably include another Marvel post-credits scene to tease Phase 4 of the MCU), I'm sitting here wondering if my bladder can even make it to Act 3. 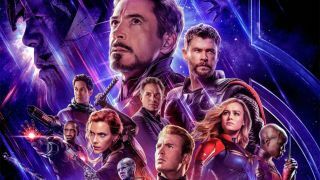 We've known for some time that Avengers: Endgame would be the longest Marvel movie to date (that previous title was held by, yep, Infinity War, coming it at 2 hours and 40 minutes), but this news finally confirms our suspicions. That said, we've had longer movies before, including The Lord of the Rings: Return of the King and Titanic, so audiences at least have some experience when it comes to single movie marathons. The best part is that, thanks to those cleverly edited trailers, we still know very little about the story details of Endgame, which means almost every minute of that runtime will be like a fresh revelation. Seriously, though, here's hoping some theatres will provide a halfway point intermission for loo breaks and snack refills when tickets finally go on sale later next month. Avengers: Endgame is out on April 25 in the UK and April 26 in the US. Check out what other upcoming movies are worth keeping an eye on throughout 2019.